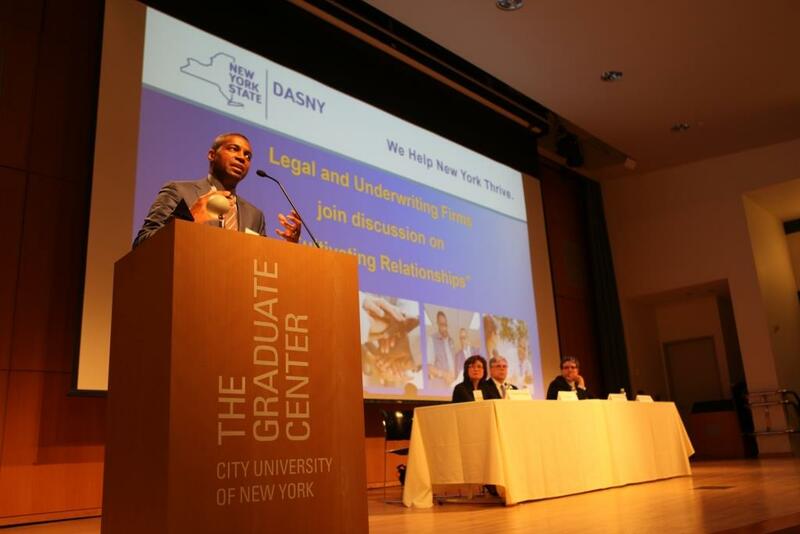 Almost 200 representatives from DASNY’s newly empanelled legal and underwriting firms gathered at the CUNY Graduate Center November 17 to seek out business opportunities with each other and with DASNY. The firms will help shape DASNY’s future as DASNY CEO & President Gerrard P. Bushell continues to drive the Authority to simplify its processes and enhance its services for clients. The more DASNY does for clients, the more it can do for New Yorkers as it builds the foundations for inclusive, sustainable communities that will better compete in the 21st Century global economy. Read Dr. Bushell’s full remarks here. 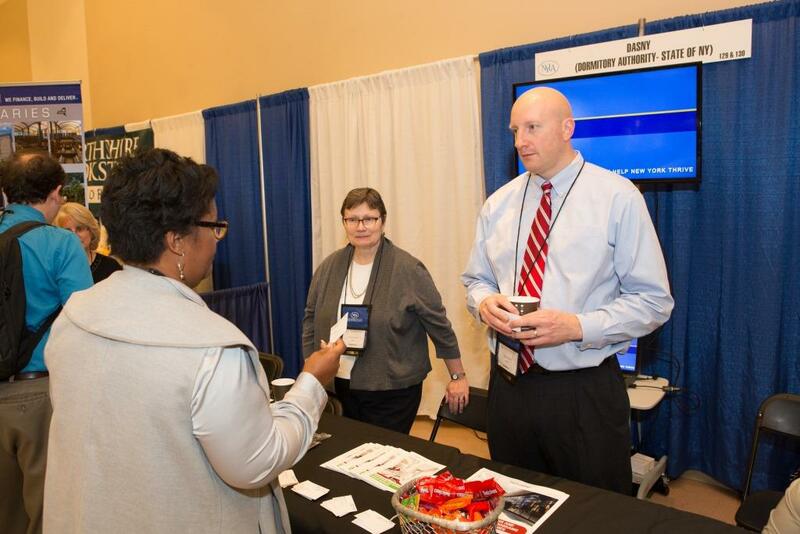 DASNY seized the opportunity to inform library representatives from across the state about the wide array of services available to them at the annual New York Library Association (NYLA) Conference. The construction and financing services DASNY provides libraries is helping them in their transformation into community hubs that can provide New Yorkers with job opportunities, career training classes and meeting places. Vibrant libraries make New York State’s communities more attractive to companies and workers, advancing economic growth. Eight members of DASNY’s staff attended this year’s conference held November 2-5 in Saratoga Springs, including members of DASNY’s public finance, grants, interior design, purchasing, design and construction teams. Together, they provided information on everything from paving parking lots, updating dated furniture, integrating new heating and cooling systems, and purchasing equipment, to available financing options. DASNY and its partners formally opened two projects and broke ground on two more in November. From Long Island in the east to Erie County in the west, each project highlights the variety and value of DASNY’s work as the Authority helps finance and build the social infrastructure that ensures high-quality education and health care services across New York State. Two projects on Long Island got their start. The first, a $4.6 million community residence in Brentwood, Suffolk County, will offer substance abuse treatment to women at a facility certified by the New York State Office of Alcoholism and Substance Abuse Services (OASAS). DASNY, in partnership with OASAS, is providing project management services, guiding the project from design through construction. Ground was also broken for the Little Flower Union Free School District Capital Project, which includes a new roof for the Wading River, Suffolk County-based school and a new wing with six classrooms, and renovations of existing spaces. The expansion and improvements will provide a welcoming and safe learning environment for students who need it the most. DASNY is providing financing for the project and construction oversight services. "DASNY is thrilled to have a hand in making this project possible," said Gerrard P. Bushell, DASNY President & CEO. "The new classroom additions as well as renovations to current spaces will provide a welcoming and safe learning environment for students who need it the most. " The first of two openings was in New York City, where on November 3, the ribbon was cut at Bronx Community College’s Campus Quad. The landscaping and roadway projects were the final phase‎ of work at the $102 million new library and classroom DASNY built for the college. The second was the grand opening of the $24.4 million Ebenezer Square Apartments in West Seneca, Erie County. This mixed-use development replaced a long vacant and blighted big box store with 25 affordable apartments integrated with a 75-unit licensed residential program. The permanent mortgage for a portion of the construction costs was funded by $16.5 million from the proceeds of bonds issued by DASNY. "These strategic investments help support some of our most vulnerable New Yorkers by ensuring they have access to a safe and decent place to call home," Governor Andrew M. Cuomo said. "This project brings together affordable housing alongside supportive residential programs, creating a truly integrated community that will foster recovery and independence."